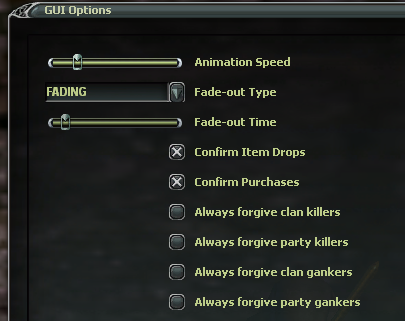 Make Party members always forgive kills. I will not create a new character, I'm an open person. If developers so hate me as a player and do not want to see in the game, I will respect their decision. My spirit will rise from the graves and the world will understand that I was right. Re: 1 kill -PK ?! So griefers can invite.noobs to party and exploit it? No. What exploit if i revive? Why would a griefer revive anyone? should be 2 kills to become RED. It does, does it not? 10 for one kill and tank still leaves you at +2? like the options in GUI options? lol already in GUI options buddy. Is he alfar race? I was trying to speak with him. We exchanged words for about an hour. I was telling him there are Russian clans and he replied that they were sad he wanted to be a crafter or something. I spent 10minutes trying to tell him to delete the stone he was mining that made him overweight. Used Google translate even. He either didnt understand or wanted to bank it, because he did say something about "bank items." He slow-walked everywhere and eventually died in a mob spawn. True but the alignment system takes alot of getting used to for casuals, so it will be an harsh if not red learning curve for new players to darkfall, there should be a better system in place for accidental kills or griefers running into your attacks on goblins with low hp and turning new players red.